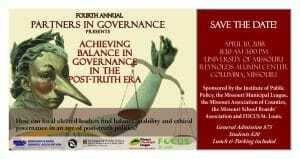 The annual Partners in Governance Conference, hosted by the Truman School’s Institute of Public Policy, brought together municipal leaders, county officials, school board executives, communication experts and MU graduate students to discuss how to achieve balance in governance in a time when online information can be unreliable, budgets are limited and polarity in perspectives is a constant factor. The partnership is an alliance between the Missouri Municipal League, the Missouri Association of Counties, the Missouri School Boards’ Association, FOCUS St. Louis and the Institute. The latest installment in the series provided a forum for discussion on topics such as transparency, best use of social media, inclusivity, fostering civil discourse and leveraging better outcomes in government despite falling levels of federal and state support. Some key takeaways included how to balance media messaging among constituents, engaging in real-time communication to disseminate information that matters to the community and building trust through the reliable and consistent use of social media. Zac Rantz, chief communication officer for the Nixa School District and panelist for the session entitled “Balancing the Media Message: Social Media – Friend or Faux?” spoke about the reality of shrinking newsrooms and the development of internal news services that organizations have countered with in order to maintain a connection with communities. Another pertinent conversation centered on inclusivity and what people can do to more effectively talk to one another and the benefits yielded by greater diversity. Wendy Doyle, CEO of the Women’s Foundation, and panelist on the session called “Balancing Perspectives-Finding Better Solutions Together” suggested that to avoid fatigue in the diversity dialogue, people should remain mindful that different perspectives can yield greater ideas and that holding a space of respect for everyone, regardless of cultural differences and varying views leads to better outcomes in general.